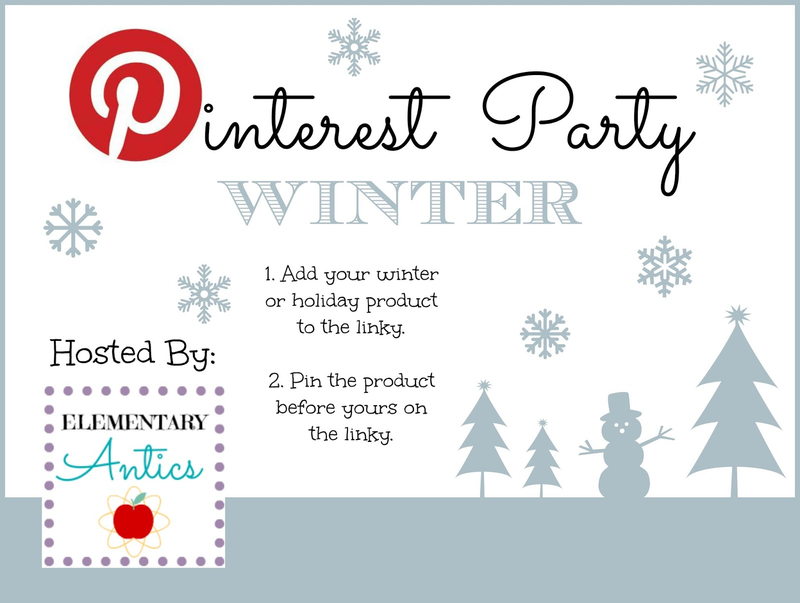 Winter & Holiday Products Pinterest Party! Each Pinterest Party has a theme. This party's theme is Winter! So, get YOUR product pinned on Pinterest by leaving your link below to your favorite Winter or Holiday Product (you can leave your pinterest link or your TpT link)! This is just in time for TpT's Cyber Monday (& Tuesday) Sale! Then, pin a few other projects in turn! This is just like any other linky party with the added BONUS that you get your link-up automatically pinned by me and others! I'm even looking to feature some of my favorites on the blog! You can help spread the word by pinning the button, sharing the party on your Facebook page, or featuring it with your product on your blog. Just right click and "save as" or copy the image and put it in your post. Don't forget to come back and check out the linky regularly for new fun ideas! 2. Pin the product before you (and more if you like)! 3. Share about the party. If you see something you love- grab it during TpT's Cyber Monday Sale! The linky will remain open until 12/15!